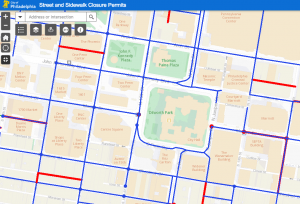 The city of Philadelphia has launched an interactive map to publicize its active and future street and sidewalk closures as part of a new multi-phase public data transparency effort. The city map, made public on Monday, was beta-tested internally for nearly a year, said Mike Matela, IT manager of the city’s Streets Department, but a construction boom brought a rise of closure complaints, both from city employees and local residents. The city received more than 16,000 permit requests last year, so when Streets Commissioner Carlton Williams asked if the city could make the map public, Matela said it was a no-brainer. “The map came about, especially a public-facing map, because of a push for transparency throughout the whole city in terms of what’s happening on any given block at any given time,” said Patrick Iffrig, chief of the Streets Department’s right-of-way unit. Residents can search the map for an address or current location, view current or future closures or submit right-of-way violations to 311. That’s addressing a major transparency question, Iffrig said, because citizens watching construction outside their offices or homes often aren’t able to verify whether it’s legal or not. Previously, residents had to contact the city’s right-of-way unit to learn about the activity on their streets. The map is powered by Esri’s software and updated every 30 minutes with data from the city’s street closure permitting system, Matela said. Clicking on a street colored red — signifying a full street closure — will provide information such as the type of work and equipment used, a description and timeline of the closure and comments from the Streets Department. Users can also access a PDF of each street’s permit and view emergency and water department notifications that could result in especially long closures. A city spokesperson told StateScoop the Streets Department plans to launch at least three other similar maps this year, but did not share what they will be for.